Will Content Marketing Stay Human? Almost since the advent of social media, marketers and audiences alike have been calling for more humanization of marketing. Social media were designed for humans, they said. So in order for businesses to market successfully on these platforms they were advised to drop traditional push marketing and adopt a human demeanor focused on building relationships. But the avalanche of information offered each day on the Internet has served to chip away at marketers’ ability to draw the attention of target audiences. Add to this the trend toward limiting organic reach and successful social media marketing gets more and more difficult. In that post Baer suggested success with social media marketing now depends on reaching audiences on as many platforms as possible – which could be taken to mean, quantity over quality. One of our favorite social media bloggers, Maddie Grant, wrote a provocative counter-post entitled, “It’s official – marketing will destroy everything good about social media,” which talks about the effects these developments could have on content marketing, and social media in general. Maddie is the editor of the popular blog SocialFish and co-author of two books, Open Community: A Little Book of Big Ideas for Associations Navigating the Social Web with Lindy Dreyer; and Humanize: How People-Centric Organizations Succeed in a Social World with Jamie Notter. 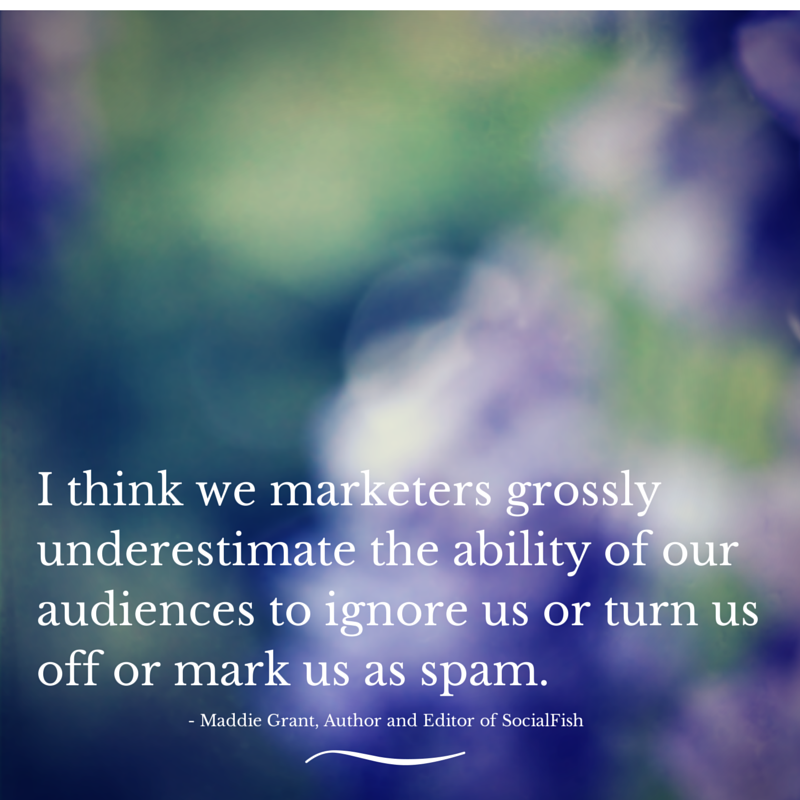 Maddie’s blog post got us thinking and spurred us to invite her to be our guest on this week’s #contentchat. You’ll find our summary of the chat, below.